Salt and pepper both sides of pork chops and set aside. Heat a med sized saucepan on med high heat. Put a small amount of oil in the pan and put pork chops in pan; do not crowd pan and let LIGHTLY brown on both sides. Remove from pan and set on a plate; season with cumin (lightly), chili powder, and garlic and onion powders on one side only. Pour coffee into pan and loosen browned ‘bits’ in the bottom of the pan. Place chops in pan, 1 at a time and put a small amount of the BBQ sauce on each chop while layering in pan. Cover and cook on top of stove for 1 hour or place in the oven and cook at 350 degrees for 45 minutes or until tender done. Enjoy ~! In a shallow dish, combine breadcrumbs, sugar, paprika, onion powder and salt. Drizzle oil over mixture and mash together with a fork until completely incorporated. In another shallow dish, lightly beat egg white with a fork. Sprinkle cornstarch over the pork slices and pat to coat evenly on both sides. Dip the pork into the egg, then press into the breading mixture until evenly coated on both sides. Place a baking sheet coated with nonstick spray in the oven for 5 minutes to heat up. Remove the hot baking sheet and carefully place the pork on. Place back in the oven and bake until just barely pink in the center (around 140 to 145 degrees on a meat thermometer), about 13 to 16 minutes. In a shallow bowl, combine the bread crumbs, chili powder and seasoned salt. In another shallow bowl, combine the egg and milk. Dip chops in egg mixture, then coat with crumbs. Transfer to a 15-in. x 10-in. x 1-in. baking pan coated with cooking spray. Bake at 350°(180°C) for 20-25 minutes or until meat thermometer reads 160°. Yield: 6 servings. 1. Heat oil in a heavy-based saucepan and fry pork until golden brown. 2. Add onion, garlic and ginger and sauté for about 2 minutes until soft. Add curry powder and fry for a few minutes until soft. 3. Add tomatoes, coconut milk, coriander leaves and seasoning. Simmer for about 15 minutes. Make a paste from cake flour and little water and thicken the sauce. Spoon into a medium ovenproof dish. 4. Topping: Sift flour, baking powder and salt together. Whisk oil, milk and egg, add to dry ingredients and whisk until smooth. Pour topping over pork mixture and bake in a preheated oven of 180 °C for about 20 – 25 minutes. Serve warm. 6-8 boneless pork chops, (I used a boneless pork loin roast, sliced in 1/2 inch thick chops. In a 9 x 13 inch greased baking dish, spread apple pie filling. Melt two tablespoons of olive oil and 1 tablespoon of butter in a heavy skillet over medium high heat until sizzling. Sprinkle both sides of the pork chops liberally with salt and pepper and sear both side quickly...about 2 minutes per side until brown and crusty. Place pork chops over apples. Prepare stuffing according to package directions and place over top of the chops. Cover and bake in a 400°F (200°C) oven for about 30 minutes. Then uncover and bake another 15 minutes until done. Preheat oven to 400 ° F (200°C). In one pan, crack the egg and beat it. In another mix together the breadcrumbs and soup mix. Place the pork into a large roasting pan, rind side up. Using a sharp knife, score the rind at 1-cm intervals, cutting deeply almost into the fat layer. Rub 2 tablespoons of the olive oil into the rind of the pork. Rub the salt into the scored skin, getting into the slits of the score marks. The fat under the skin reacts with the salt, making it puff up and crisp up. Drizzle the remaining 1 tablespoon oil in the pan and roast for 20 minutes. Reduce the heat to 180°C/350F and cook for another 2 hours (or half hour per 500g). Optional: For a great crackling, look for a good coverage of fat and rind. Pork cuts that are suitable for roasting include leg, rack, rolled loin and rolled shoulder. Place gammon in a dish. Blend the wine and 30 ml of honey. Add the bay leaves and pour over the gammon. Cover and refrigerate for 360 minutes, turning occasionally. Drain the marinade and set aside. Wrap the gammon in a double layer of foil. Place gammon in roasting dish and cook for 90-100 minutes. Remove gammon from foil and leave to cool. Remove the rind from the gammon and using a sharp knife cut a diamond pattern into the fat. Increase oven temperature to 210° C.
Spoon over the remaining honey. Return the gammon to the oven for 40 minutes until brown. Blend the apricots with 60 ml of water, place in a sauce pan and bring to boil. Serve the gammon hot with the apricot sauce. Heat the oven to 350°F (180°C) and arrange a rack in the lower third. Remove any plastic packaging or netting from the ham. Trim any excess fat from the ham, leaving about a 1/4-inch layer all over. Set the ham aside to rest at room temperature for 30 minutes. Line a baking sheet with several sheets of aluminum foil (it will make cleanup a lot easier). Place the ham, cut side down, on the baking sheet and cover with a piece of parchment paper. Tightly cover the ham and parchment paper with aluminum foil and bake for 45 minutes. Meanwhile, combine remaining ingredients in a small saucepan over medium-low heat, stirring occasionally, until butter melts and brown sugar is completely dissolved, about 3 minutes. Set aside and let cool to lukewarm (the glaze should be the consistency of room-temperature honey). When the ham is ready, remove it from the oven and increase the oven temperature to 425°F (220°C) . Discard the foil and parchment paper, and, using a sharp knife, score a 1-inch-wide diamond pattern (don’t cut more than 1/4 inch deep) over the entire ham. Brush the ham with 1/4 of the glaze (about a generous 1/3 cup), return it to the oven, and bake uncovered for 15 minutes. Remove from the oven, brush with another 1/4 of the glaze, and repeat every 15 minutes until all of the glaze has been used and a dark golden-brown crust has formed, about 55 to 60 minutes total. Let the ham rest 20 to 30 minutes before slicing. Mix the honey, mustard, soya sauce, lemon juice, garlic and chillies together. Place the chops into a dish suitable for marinating and pour the honey and mustard mixture over. Marinate the chops for at least 30 minutes but preferably 24 hours. Heat the oil and brown the chops on both sides. Reduce the heat and pour half of the remaining marinade over the chops, turn around and cook on low heat for 5 minutes. Pour the other half of the marinade over the chops, turn around and cook for another 5 minutes. Mix together flour, onion powder, garlic powder, red pepper, salt, and black pepper in a pie plate. Coat pork chops in flour mixture; shaking off the excess. Over medium heat in cast iron skillet, melt bacon fat and oil together well. Gently lay pork chops in skillet; fry about 5 minutes on each side until golden brown. Mix ½ cup flour mixture and buttermilk together well; pour into skillet, stir into hot fat; bring gravy to boil then reduce heat to simmer until nice and thick, stirring often. Return pork chops to skillet; cover with gravy. Simmer for 5 minutes or so until pork chops are cooked through. Season with salt and pepper; garnish with chopped parsley or green onions if using, before serving. Variation: May sauté onions and or mushrooms with pork chops and add to gravy mixture. 1. Pat ribs dry with paper towels. Combine paprika, 1 tbsp of the onion powder, the salt and pepper in a small bowl. Rub onto both sides of ribs. Place meaty side up on a baking sheet fitted with a wire rack. Cover tightly with aluminum foil and refrigerate overnight. 2. Heat oven to 150 deg C. Transfer foil-wrapped ribs directly to oven and bake at 150 degrees C for 3 to 3 1/2 hours or until fork-tender. 3. Meanwhile, melt butter in a small pot over medium-low heat. Add garlic and cook 2 minutes or until softened. Stir in ketchup, honey, molasses/sugar, Worcestershire, vinegar, mustard and remaining 1 tsp onion powder. Simmer 15 minutes until sauce thickens. Cover and set aside (see Note). 4. Remove ribs from oven. Increase temperature to 200 degrees C. Remove foil and brush ribs with 1 cup of the sauce. Return to oven, uncovered, and bake at 200 degrees for 10 to 15 minutes until sauce is bubbly. 5. 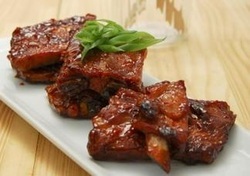 Slice ribs and serve with remaining sauce alongside. Sauce can be made a day ahead and refrigerated. Yield is approximately 1 2/3 cups. Preheat oven to 250°F (120°C). Ribs will cook for a total time of 4 hours. Combine all of the dry rub ingredients in a small bowl. Prepare the rack by removing the membrane from the back of the ribs and cutting away that extra little flap of tough meat across the top - just discard that or save for another use. Line a baking pan with aluminum foil. On the bottom side of the ribs, sprinkle on a generous amount of the dry rub and rub it in. Set the ribs on the baking pan with the seasoned side down, and apply the remaining dry rub on the top side. Roast uncovered at 250°F (120°C) for 2 hours. 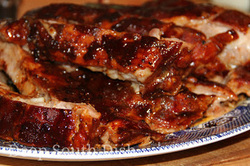 After the ribs have cooked for 2 hours, remove them and pour some of the sauce over the top of the ribs. Using a brush, gently spread the sauce all over the ribs. Cover the entire pan tightly with aluminum foil and return to the oven, baking for an additional 2 hours, or until the meat begins to pull away from the bone. If you like, unwrap, brush with a bit of sauce and finish under the broiler for a minute or so. Combine all of the ingredients together and whisk to blend. Cook's Note Add two tablespoons to 1/4 cup of Maker's Mark or Jack Daniels, for variety. Can substitute pure maple syrup, sorghum syrup, or molasses, loosened with a bit of corn syrup. Set the ribs in a large pot with water and add the thyme, oregano, garlic powder, salt and pepper. Cover the pot and bring to a boil and allow to it simmer for 40 minutes. Remove the pot from the heat and set aside until the grilling is ready to commence. Now mix together the sauce ingredients and blend well. Remove ribs from its liquid and generously brush both sides with the sauce. Barbecue the ribs 8 inches from the coals for about 20 minutes or until brown and crisp. Continue to baste frequently while grilling. Serve the meal with remaining sauce on top and whatever side dishes you would enjoy.